FAO Moon Hoax believers: Look! 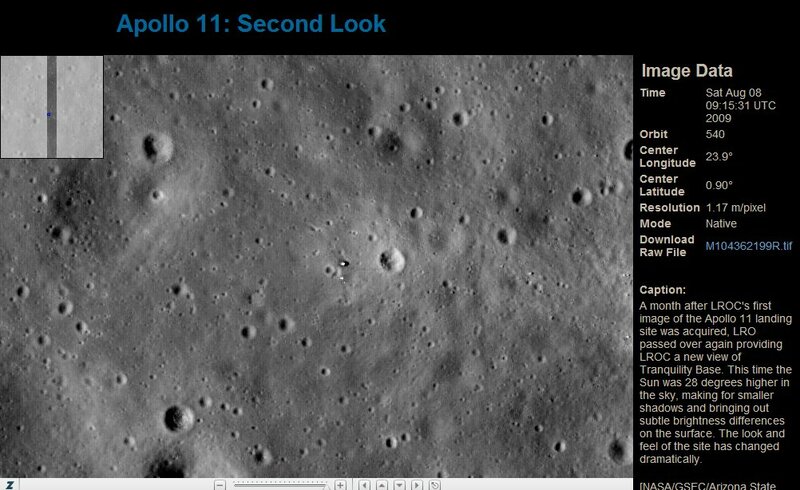 A new LRO image of Tranquility Base! 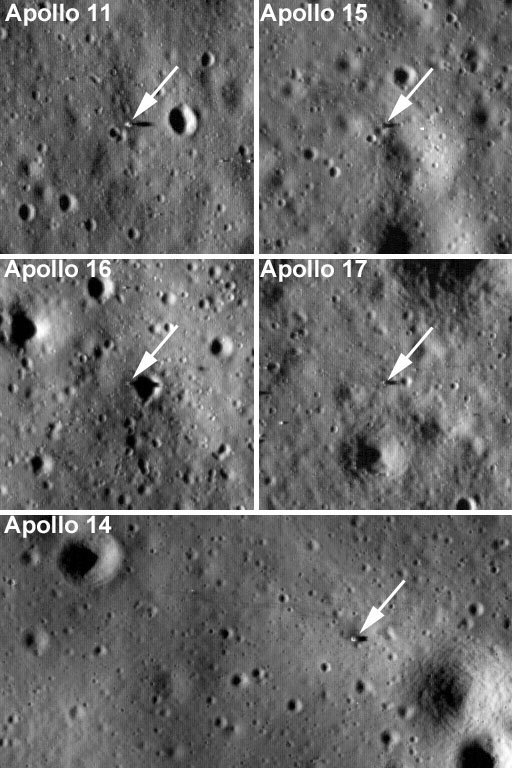 You might remember that earlier this year I wrote a piece on here predicting that it was unlikely that the images released by NASA’s Lunar Reconaissance Orbiter, showing the Apollo landing sites, would finally silence the people who insist that the Moon landings were faked. Although my predictions turned out, sadly, to be true, it was very gratifying to receive a lot of positive feedback about that post, and to have it linked to and even praised on some high profile websites. But some “Moon Hoaxers” took exception to it, and gave me a hard time, in emails and on comments here. Which is fair enough. You write something like this and you’re leaving yourself wide open to criticism or even attack. It goes with the whole “Blogging” thing, doesn’t it? One comment – a very polite one, don’t get me wrong – was recently posted here accusing me of not having an “open mind. Really? I do have an open mind, about a lot of things. I have an open mind re the existence of Bigfoot, the Loch Ness Monster, and many other stories torn straight off the “Wall of Weird”. I have an open mind re the possibility of Jim Carey getting through a movie without gurning dementedly. I even have an open mind re the chances of turning on one of Sky’s music video channels later, and not seeing a hip hop or rap or R n B video playing. Hey, it might happen, one day..? What I don’t have an open mind about is Apollo, and whether or not we “went to the Moon”, because no open mind is needed. We went to the Moon. Fact. Absolute, undeniable, proved-god-knows-how-many-times FACT. The many tens of thousands of people who worked on, reported on and watched Apollo say so. The TV networks that covered the missions say so. The Russians – who desperately, desperately wanted to be first to the Moon – say so. 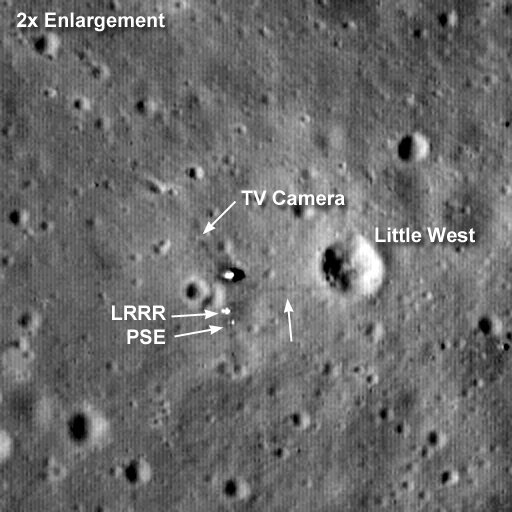 Photographs taken by LRO say so. The men who WENT TO THE FRAKKING MOON say so. And a new image released today says so, too. See? 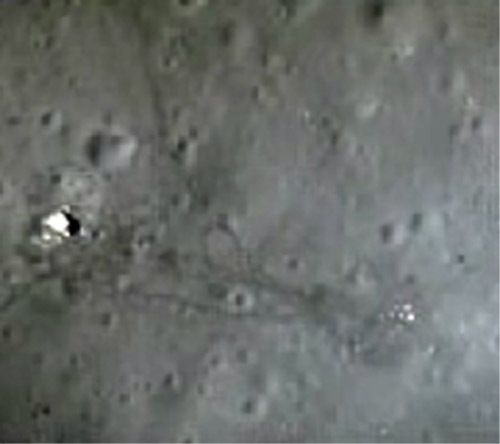 Those are trails of footprints running between the LEM, the crater to the right, and the instruments close to the Eagle. See? That’s the camera! See? That’s HARDWARE, equipment we built and set up On The Moon! But will these new images finally convince the unbelievers that people really did walk on the Moon? No. Never. Never ever ever. Not in a million, gazillion years, because a) that would mean admitting they were wrong all along, and b) it would mean they suddenly had a whole load of free time on their hands without a clue how to fill it. 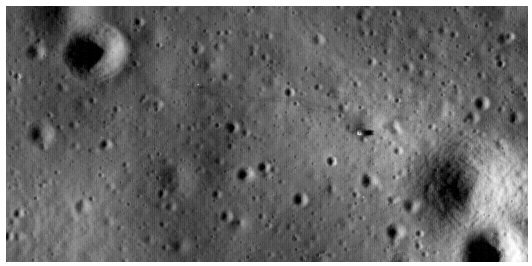 I honestly believe that it LRO actually fell on top of the Eagle lunar module and took one last picture, showing the rivets in the spacecraft and bags of urine on the Moon’s surface the hoax believers would STILL say it was all faked. Now, free speech is great, it’s a wonderful, wonderful thing, but there’s a difference between “freedom of speech” and “freedom to be a bloody idiot”. 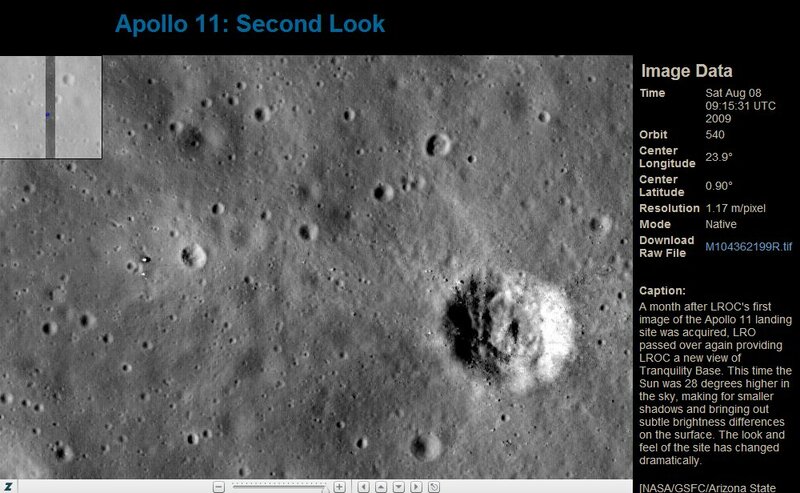 So, please, if, after seeing these new pictures you STILL believe the Moon landings were hoaxed, then fine, you go on believing that. You have, after all, a right to persist in believing that crap. And hey, if it makes your days go a little quicker, if it gives you something to believe in, then go for it. … and you have nothing. So that’s it. My days of trying to reason with you Are Over. I have no time for you. We’re through. And if you don’t like that position, if you feel that is restrictive or undemocratic or antisocial, then awwwwww, boo-hoo.